The house is at least 200 years old and built on 3 sides around a private courtyard. The three wings of the house all connect to each other via the courtyard. 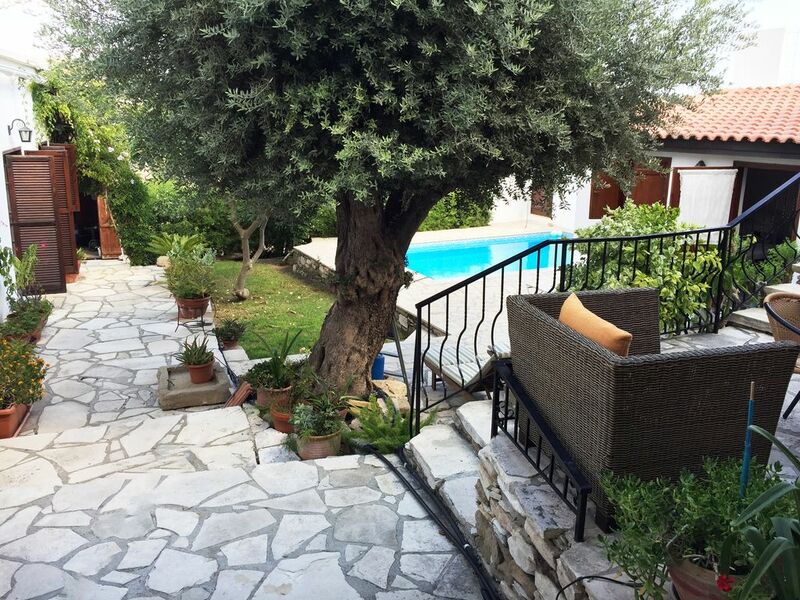 There are lovely stone paved areas with plants and swimming pool, graced with an ancient olive tree which gives welcome shade in summer. The Cobblers is the home of fashion designer Marguerite Hannah who has brought her designers vision to the lovely artistic interior, which features personally chosen art and objects which enhance the beautiful peaceful ambience of this special house. Cobblers is new to the holiday market for 2018. Previously only used by the owners and friends. There is a spectacular elevated furnished sun deck where you can enjoy the sea views with a glass of wine at the end of the day. During the day you can enjoy the private swimming pool which has ample sun beds around the stone patio area around the pool. The outside area is substantial and you can always find a little quiet space around the garden which is filled with lovely Mediterranean plants and flowers in terracotta pots. There are 3 spacious bedrooms, 1 double ,1 family room with double bed and sofa bed and 1 twin. One wing of the house has the twin and family bedrooms which share the family size luxury bathroom with walk in shower. The other double bedroom is located across the courtyard and has its own en suite shower room. The large kitchen has a large cooking area along with a spacious dining area with table and chairs to sit 8 people very comfortably. On the first floor there is a very large double size lounge separated by an open arch. On one side there is a tv room with DVD player and large video library. We have just installed international SATELLITE TV including GERMAN and UK stations.You can also connect your own devices by supplied hdmi cable. On the other side is a cosy reading lounge with two large armchairs and wood burning stove for romantic winter evenings. We also have a quiet room with a collection of books on the ground level. There is covered parking for 1 car and plenty of space on the adjoining land for other vehicles. A car is fairly essential to enjoy your stay at the Cobblers and car hire is very reasonable in Cyprus. Very small children would need to be supervised due to the stone steps and terraces which make up the garden. Maroni is almost equidistant to Larnaca , Limassol and Nicosia, which are all well within 1 hours drive. The Village of Maroni is very traditional and picturesque but it has a supermarket and a lovely coffee shop/bar with an English owner a few steps from the house where you can enjoy a cocktail and light snacks. The fishing village of Zygi is about 10m drive away and has an array of seafood restaurants. The house is a five minute drive to the local beach which is about a mile away. The Cobblers is a unique and special house and we are sure you will enjoy your stay. Everything you could need to appreciate traditional Cyprus but with all the modern comforts. 37” hd TV + Satellite TV including German and UK stations. DVD player with large dvd library and HDMI cable to connect own devices..
Dishwasher, fridge.freezer electric hob and oven, breakfast bar, fitted kitchen, dining area with table and chairs for eight. A home from home...and then some! I’d like to start with a remarkable coincidence. A few years ago we were staying in a property in Maroni. I was fascinated by the house next door. It had a raised sun terrace and an arched double door with a peep hole in it. As it appeared to be unoccupied at the time every time I walked by I looked through the peep hole to see if I could make out what was beyond the door. It wasn’t until we had actually finalised the booking that I realised that The Cobblers was that exact place! I couldn’t have possibly imagined what was beyond those doors. It’s truly amazing! We were rather spoiled, having the whole place for just two of us but there is more than enough room and everything you need for full occupancy! Alan was very helpful on the couple of occasions I contacted him with minor queries and responded quickly. We stayed for 10 days but would have loved to stay much longer - could even imagine living there! It was great chatting to Marguerite’s sister who arrived just as we were leaving. She had a large paper bag of still warm savoury pastries with her. Probably not one of my more sensible ideas - driving down those narrow streets while eating a pastry. It was delightful though. We love Cyprus and especially being away from the cities - they are all still a must for a visit though. Staying at The Cobblers made this holiday even more enjoyable. It is such a delight for us to share the house with people who really appreciate its character and comfort as well as our beautiful ,simple but unspoilt village of Maroni. It was an absolute pleasure having you as guests, Maro and Anna enjoyed talking to you and send their thanks for leaving the house in such a pristine condition. We would love to see you back at Cobblers again. Lovely property with plenty of character. A little hard to find but this place is tranquil... we had a really peaceful, relaxing week. The master bedroom mattress was not very supportive of bad backs, and you'd probably struggle to get around the place with bad knees (lots of steps!) but we cannot otherwise fault the property. We spent many afternoons relaxing under the shade of the olive tree & swimming in the pool, mornings having breakfast on the roof terrace & evenings playing cards in the sitting room. The kitchen is fully equipped and basic food & alcohol supplies await you in the kitchen. AC in all the important rooms and no shortage of places to sit & relax. Alan (owner) was also very helpful & quick to respond via email. We'd definitely recommend this place to others if you're looking for an escape from the hustle & bustle. Food at The Old Coffee Shop (Maroni) and Retro Tavern (Kalavasos) was very good. Koumbaris (Zygi) was disappointing. We are so happy you enjoyed your stay at the Cobblers and Cyprus. You were fantastic guests and we would welcome you back any time. We try to make the directions as clear as possible but we are going to put a few signs up to make this easier. Absolutely beautiful villa! From the minute we saw this place we knew it was perfect for us! The aim of our holiday was total peace, quiet and relaxation away from the hustle and bustle of a tourist resort and we were not disappointed! The property is split over 4 levels with entrance hall and kitchen on street level then steps down to the snug, with further steps down to the bedrooms and pool. On the upper level is the snug/living room and at the top is the fabulous roof terrace where we spent much of our time having breakfast while watching the sun come up, and having our evening meals watching the sunset. The pool area was lovely and very private, with welcome shade from the olive tree during the midday sunshine. This area gets the sun from very early morning until around 5pm and from then we went up to the roof terrace where the sun finally disappeared behind the village around 7pm. Alan was very quick to answer any questions we had both before and during the visit, and the welcome basket of wine, tea, coffee, butter, bread, water, crisps and fruit was much appreciated and a very nice touch. Thank you so much, we cant wait to return! Thank you for your lovely review Louise and Chris, it was an absolute pleasure having you as guests and we hope to welcome you back again soon. We have taken note of your comments and will always try to improve our guests experience and act on any advice given. Nice house, nice surrounding. Good position for trips in all areas on Cyprus. The house owner Allan is a very friend kann and helpful guy. Definetly a recommendation. Thank you for your review. It was a pleasure hosting you and your friends and we hope to see you again soon. La maison d'Alan et Marguerite est un havre de paix et délicieusement décorée. Nous y avons passé douze jours formidables. Cette vielle maison chypriote est particulièrement bien équipée. La décoration est soignée et de bon goût. Le jardin et les terrasses sont une invitation au délassement et au farniente (les belles soirées sous les étoiles! ).A noter le gentillesse et la disponibilité d'Alan. Tout est mis en oeuvre pour que ses hôtes se sentent bien (remarquable panier d'acceuil , frigo avec de quoi dîner et prendre le petit déjeuner ),à découvrir sans modération! remarquable! Thank you for your kind words and lovely review. You were the perfect gentleman to deal with and you and your party were wonderful guests. Thank you for staying at our house and we hope to have you back soon. Thank you for your lovely review, you were fantastic guests, it was a pleasure to speak to you and we would welcome you back any time. So glad you had a great holiday in Cyprus. Maroni is almost equidistant to Larnaca , Limassol and Nicosia, which are all well within 1 hours drive. The Village of Maroni is very traditional and picturesque but it has a supermarket and a lovely coffee shop/bar with an English owner a few steps from the house where you can enjoy a cocktail and light snacks.